Sister Patricia Helen Neihouse begins her life review with Mary’s prayer of praise: “My soul proclaims the greatness of the Lord.” (Lk. 1:46) May the story of her life which we recall with gratitude at this time truly be a prayer of praise. For, as that prayer continues, ‘God who is mighty has done great things for me. Holy is God’s name. '” God has done great things in and through her life. Pat Neihouse was born July 25, 1936, to John and Inez Ella Foulke Neihouse. She was the fifth of their 13 children, six of whom have predeceased her: Margaret Bruce, Marie Lewis, Joan Lust, Julia Ann Wooldridge, Janet Neihouse and Mary Louise Neihouse, who died at birth. Her parents, too, have gone before her. And now, her sister Mary Catherine Billinger has joined her in eternal life. Sister Pat is survived by her siblings: Elizabeth Hoggatt, John Neihouse, Virginia Gross, James Neihouse and Gerry Parker, as well as nieces and nephews, and extended family. Pat was baptized at Sacred Heart Cathedral and attended both the elementary and secondary schools there. Her parents valued Catholic education. She loved school and was a good student. In her life review, with fondness, she remembered the Sisters of St. Joseph and others who were her teachers. She was a tomboy who loved sports. She reminisced that when she was small she was always losing her hair ribbons. Later, she played on basketball and baseball teams. One of her special memories from her growing up years was having her Grandma Neihouse live in their home with them. When she later entered religious life her dad said to her, “You know it was because of your grandma.” Pat also gives credit to Father Wasinger who accompanied the Legion of Mary and impressed her with his help given to alcoholics and to the needy. He supported her desire to be a Sister of St. Joseph, encouraging her to write to Mother Helena. Sister Pat was enthusiastic about the formation of the laity, helping them to grow psychologically and spiritually. Over her years of mission work in Brazil she worked in parishes in Teresina and Amarante. She accompanied workers, and tried to help the poor improve their living conditions, coordinating fundraising for aid to the poorest on the periphery of Escalvado, including beginning a community garden. She also worked in the Archdiocesan Catechetical Office, after completing a preparatory course in catechetics. Between 1967 and 1976 she completed other certificate courses in areas of psychology and counseling, and a course for those who would become religious formators. In the years that followed, she took on many other ministries: retreats and spiritual direction, directing Bible groups, Novice Director, Coordination of the Sisters of St. Joseph in Brazil, Coordinator of the National Conference of Religious of Brazil in Brazil’s northeast, and teaching Enneagram workshops. When the Congregation opened a mission in Nova Esperança, in the southern part of Pará, Sisters Janira, Augusta and Rita went with Pat to work with nine base ecclesial communities, living among the people in a little house with a thatched roof. In the Diocese of Conceição do Araguaia they helped the poor to learn about their faith and about human rights, and how to improve their health. Upon returning to Teresina, she resumed giving Enneagram workshops touching the lives of more than 4,000 vowed religious, priests, bishops and seminarians, as a means of self-knowledge, personal growth and spiritual deepening. Pat returned to Brazil, and resumed ministries in leadership, religious formation and and other ministries. She was blessed by being present for the 50th anniversary celebration of the foundation of the Brazil Mission and her own 60th jubilee of religious life. When Sister Alexsandra took on the study of English, Pat mentored her through opportunities for conversation in English. When I had the privilege of spending six weeks with our sisters in Brazil in 2014, Pat also took me under her wing until I regained enough Portuguese to speak for myself. She was a gracious hostess. On Nov. 9, 2017, Pat returned to Concordia due to illness. Leaving Brazil did not end her relationship with the sisters there. She continued to write emails and communicate with them through technology, until that became impossible. Since her passing on Sunday morning, I have received various messages of grief from some of the sisters in Brazil. Their Regional Coordinator, Sister Nair, also wrote to let us know that every night the sisters and many others who loved Irma Patrícia, have been saying a rosary for her. 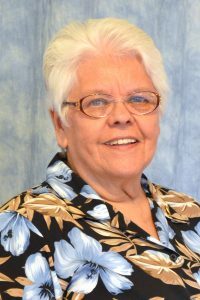 Saturday, they will celebrate her life at the “Seventh Day Mass,” a memorial Mass in St. Joseph’s Church in Teresina, with all the sisters, the Redemptorist priests, parishioners and many of Pat’s friends present. Pat appreciated her five months at the Motherhouse in Stafford Hall, grateful for the care she received and the time she spent with the sisters, especially playing rummy. She loved to go swimming and be outside. Her illness made it necessary to move to Mount Joseph on April 5, 2018. She has expressed gratitude for the faithfulness of family and community members who have visited her, for the care offered by staff and our sisters who minister at Mt. Joseph, and for the little things like jigsaw puzzles, card games with Sister Lucy, watching the birds outside her window, and an abundance of correspondence, even though her illness and “saudades” or longing for the Brazilian community caused significant suffering. With new unfaltering steps may you follow Jesus into the life of unending Love.